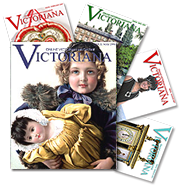 The collecting of antiques is a popular pastime. There are few antique collectors that do not boast of some pieces of ancestral and heirloom silver, even if they may be only a few well-worn spoons that belonged to a great-grandmother in the days when silver spoons were a luxury. The interest in collecting antique silver is now so genuine that such gifts are very popular for weddings and especially at christenings. One should be as careful in selecting the recipient for such gifts as in picking out the gifts themselves, for a bride or young mother with no taste for antique silver would of course prefer something new. A list of sterling silver gifts for the affluent baby in 1910 included a Silver Peter Rabbit bib holder, Silver Teddy Bear bib holder, sterling Dumb-bell rattle, sterling Baby shoe buckles, polished silver Safety-pin set, and a sterling Birth record spoon. There are many collectors who specialize in spoons. 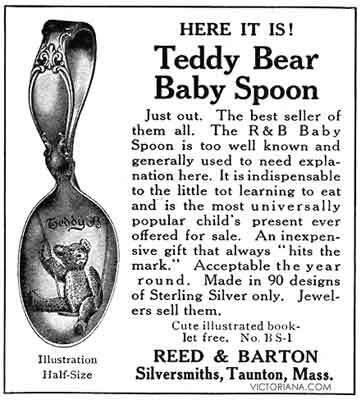 A memorable gift for new parents could be an antique baby spoon; a favorite keepsake is the antique teddy bear spoon as shown in the advertisement below. Antique silver spoons featuring a Teddy Bear was offered by Reed & Barton in 1907. This antique spoon was "an inexpensive gift that always hits the mark ... year round." It was indispensable to the little tot learning to eat and one of the most popular child's presents. This spoon was of sterling silver only and sold by jewelers. No form of collecting is entirely free from expense, yet collecting silver souvenir spoons can, upon the whole, be recommended for affordability. Moreover, spoons are easily kept and time does not impair their value, beauty, or interest. Even their intrinsic worth varies but little, for souvenir spoons are almost always manufactured from silver — engraved, gilded, or enameled. These silver spoons typically feature inscriptions struck or cast to commemorate a person, an institution, or an event — are generally of silver, sometimes with gold bowl, but seldom all of gold. In shape they are usually of coffee or tea pattern; sometimes pap, dessert, sherbet, chocolate, and sugar designs. The fad of spoon collecting advanced rapidly in America in the late 19th century through the early 20th century. Generally souvenir spoons chronicled some historical event, such as a World’s Fair, or were connected with some locality, or else a characteristic building or scene. Many silver spoon collections feature items from various European hotels. Several special designs were made to present at theaters on souvenir nights; also in several instances they had been used for advertising; thus special guests of certain hotels were presented with spoons, and certain large manufacturing firms gave spoons of characteristic designs to important clients.